I ate here over the weekend on a girl’s day, we decided that we had a craving for sushi and remembered that Kabuki had opened recently in Tivoli Village, and this would also give us a chance to check out the farmers market that is held at Tivoli on the weekends. We got to Kabuki a little after 11 am I would say and the place was pretty empty, so we were seated quickly. Someone came over right away and got our drink order, and shortly after our waiter came over to see if we had any questions. 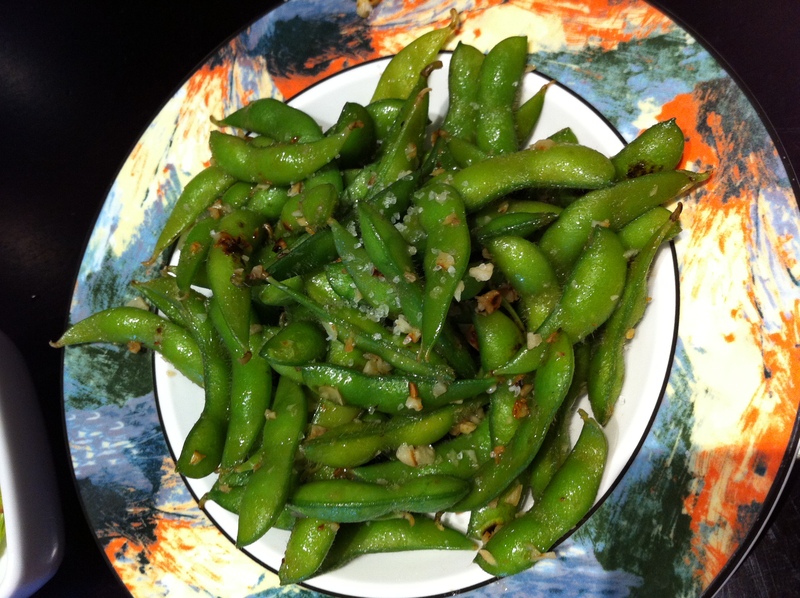 To start our meal we decided to go with the garlic edamame. Before this came to our table our waiter brought us complimentary edamame to the table because we had ordered sushi, we were a bit disappointed that he did not tell us that edameme came with our sushi because if he had we wouldn’t have ordered it as an appetizer. Granted they were different one is cold the other is warm with garlic, salt & spices. Maybe we would have ordered something different. But it was the principal behind it; it would have been nice that he said something. We decided that we would get 4 rolls to share, the downside to sharing with me is I for some reason can not stand the consistency of spicy tuna, I blame it on a hand roll I had at a charity event it was just too much for my pallet and I haven’t been able to eat it since. So I am constantly trying to find rolls that do not have it in , which I will admit is a lot harder than you would think. It seems to be the default ingredient for a lot of places. We eventually decided on the Lotus roll, AAA Box roll, Alaskan roll & Smokey Philly roll. 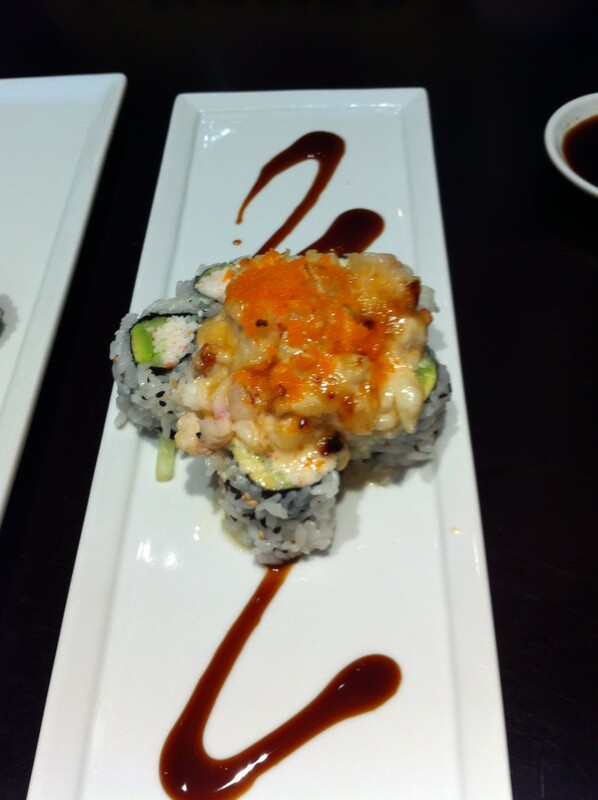 First up the lotus roll: Baked premium lobster meat on top of California roll served with eel sauce. I really liked this roll the lobster was cooked perfectly and they gave you plenty on top so you don’t feel as if you paid too much for just a California roll. I would for sure order this one on my next trip to Kabuki. 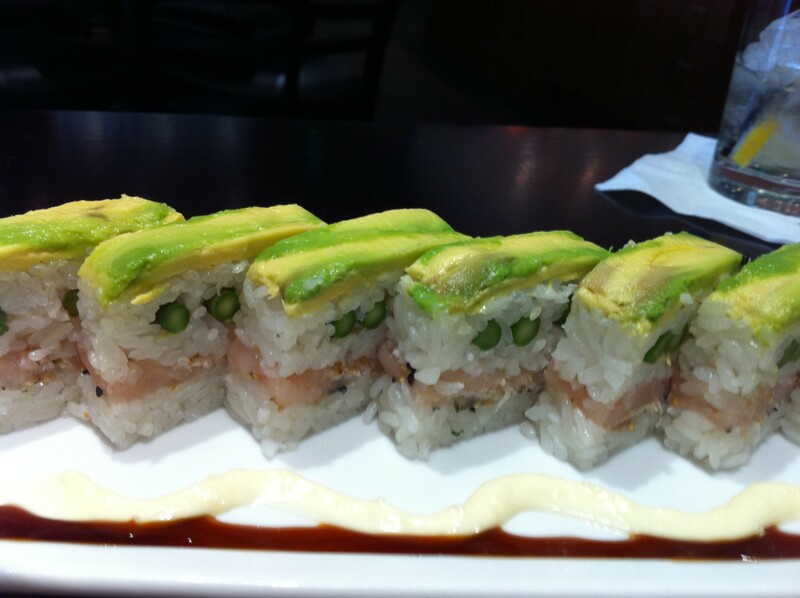 The AAA Box roll is albacore tuna layered with asparagus between rice and topped with avocado, with what we assume is eel sauce and some kind of mayo sauce. These were not listed on the item description but both were a nice addition to the roll. My only critique of this roll is that I really didn’t taste the asparagus, which if I am ordering a roll with it in it I want to feel like I am getting asparagus. It was just lost in everything. Also the layer is a nice presentation but really was kind of difficult to eat since it made the pieces twice the size of a roll. 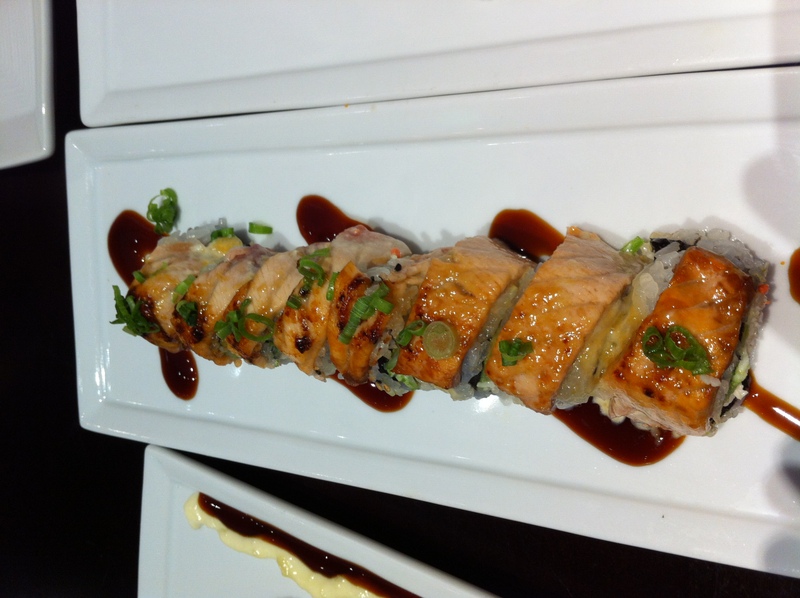 The Alaskan roll was a California roll topped with basked salmon, while I really enjoyed this roll my friend was only kind of on board. It was a nice flavor with the baked salmon, but really because it was another California roll I could see how it was kinda just blah. The last roll we had was the Smokey Philly roll, this seems to be a pretty standard roll no matter which sushi restaurant you go to. The only difference is that it had smoked salmon inside instead of just plain salmon; and to be honest it could’ve been plain and I wouldn’t have known. It didn’t have an abundant smokey flavor that smoked salmon has which is one of the reasons I enjoy getting rolls with smoked salmon. Overall the service was very good despite our waiter having a cloud of cologne following him, the bussers were quick to clear out the empty plates and refill our drinks. The sushi was very tasty and got to us quickly, my major critique as a whole was that the rice was extremely soft, meaning the rolls didn’t stay together and fell apart easily, especially the AAA box roll and Smokey Philly. This is the main reason I removed a star, because if you are a sushi restaurant your rice should be on point. 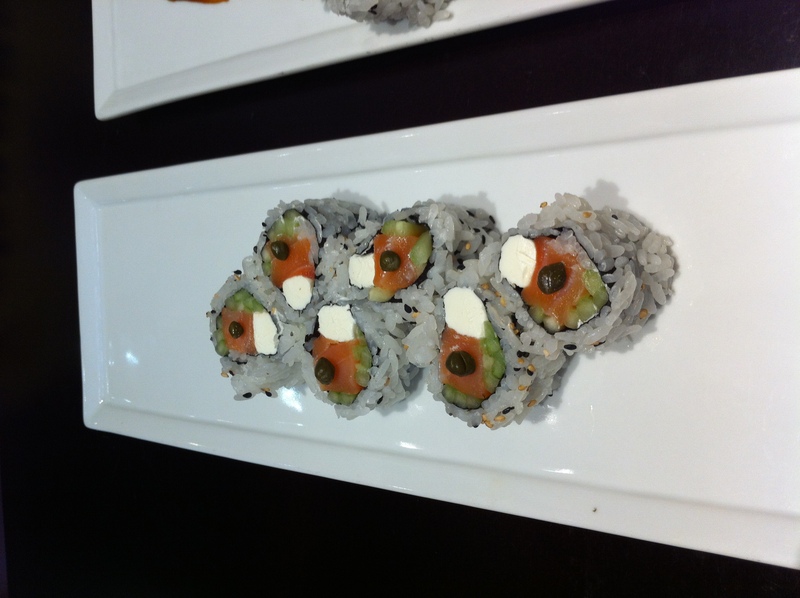 The rolls did come with 6 – 8 pieces depending on the roll, which was good for sharing. Our entire meal was a total of $52 including tax, so for basically $25 a person we had a nice sushi lunch. I would recommend them whether you are at Tivoli or Town Square if you are looking to fill your sushi craving for the day.